WhatsApp is one of the many applications which is frequently updated and more and more new features are pushed. Previously we saw how the app was updated with the public group features. The application was also recently updated with new camera improvements as well. Interestingly, one thing to note here is the fact that all these new features were pushed to Android OS first before the others. But now the latest new feature which the company has to offer is now being pushed to Windows platform first. The new feature we are talking about here is the Video calling feature. Undoubtedly this is one of the most requested features of the bunch and was expected by many for a long time now. But as mentioned earlier, instead of pushing this new feature to Android, just like they used to do, the company has now made this new video calling feature available to the Windows platform. This new feature i.e. 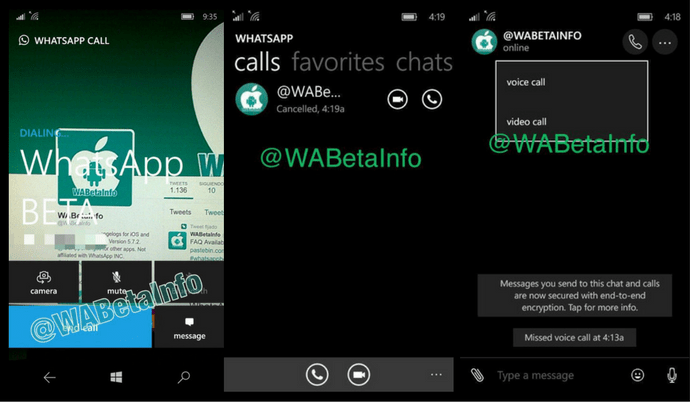 te video call feature is enabled by default in WhatsApp for Windows Phone. If you didn’t know already, the developers of the app just pushed the 2.16.260 beta update for the platform, and it looks like the video call feature was readily available for users to make use of it. And the way this works also makes it very usable in any given condition. When you click on menu for making a call from within the contact, instead of showing just the option for the voice call, now you also have an option to make a video call from the same menu. Alternatively, when you click and expand a contact to view more details, there also an option for making a video is now available for users. It looks like the video calling feature is baked right into the app for easy access. And this will work exactly how one would make a voice call. Tap on the video call, and it would connect to the user on the other end. And all the call history will be shown together under the call history. If you miss a call, then it will be notified just like if you would miss a voice call. The fact that the feature is now live is refreshing but since it is only available for Windows phone now is the major issue for other platform users at least. But considering the fact that majority of WhatsApp users would be either on Android or iOS platform, we will not be surprised to see them rolling out the feature soon to other platforms as well. Previously the same feature was made available for Android and the APK was also available to download, but the feature didn’t work well. With that being said, let’s just wait and see when the other platforms will get the update on this.